A great coach said, "Fatigue makes cowards of us all" (Vince Lombardi). This applies to goalies too. As important is that fatigue makes us seriously slow. I was working with an up and coming high school goalie the other day and as the lesson/workout went on she hot worse. I looked for a cause and noticed that she had quit stepping. So, my good shots to the corner, especially on the off-stick side were going in as she just stabbed with her hands and missed. Many goalies are slower than they could be because the don't step or they drop their hands just because they are out of shape. Now it would be neat to say that this is unusual, it is not and it happened to me. I am in my ninth month of rehab - TO GET IN SHAPE. My upper arms/shoulders and my legs were so out of shape that I wasn't getting to shots I usually get to. I was blaming everything else. With help of a professional (Nick Triandos), I have gotten some leg strength back and now am working on my aerobic/endurance conditioning too. In my case my game had fallen to the point that I retired. With Nick's help, I am back from retirement (I played well in Lake Placid, 2010) after the 1st six months of rehab and am getting stronger and now running a little. Walk then Run and Jump - I see a lot of goalies like me, too tired to be effective after the 1st quarter. So here is what you do. Walk for an hour a day three times a week. When you get stronger, jog an hour three times a week. When you can do that (and keep that up) add in jumping over the shaft of your stick 100 times three days a week. Lifting Weights - Add in lifting weights to strengthen legs and arms. For arms do 20 reps starting with the weight at the waist and lifting it over your head. Wait 30 seconds and do 20 more. Do this a total of 5 times. If you have trouble with the last set you are at the right weight. I use 15 lbs in each hand and vary how I to the 1st part of the lift from just pull up to the shoulders and then press to the ceiling, to doing a curl to the shoulders and then press up to the ceiling. This helps you keep hands up and strong throughout practice and games. For legs work three days a week. I do quadriceps and hamstring curls in equal amounts with a lot of repetitions (reps) and modest weight (e.g. 100 reps with 10-15 lb leg weights) and then do squats. Do half of your quad curls with the toe pointed in and half pointed out so that all four of the quadriceps muscles are strengthened. Add in 100 jumping jacks and your will get stronger. When to Start - NOW. If you are out of shape or overweight, this is going to take a while and if you start now you MIGHT be in shape for spring lacrosse. Work 3 days a week and make every workout harder if you can. Your game will improve dramatically. Keep a Scorecard - take a calendar and write in when you are going to work out and mark through if you did it. Get a partner if your can and you will be more consistent and focused when you work out. 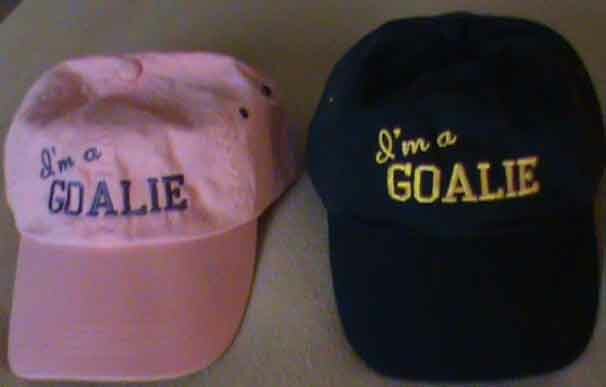 Christmas Gift - "I'm a GOALIE" hats in Navy Blue with Gold Lettering or Pink with Purple lettering - get your today.